AV Club: The earnest Sundance-winning drama Frozen River is one of those movies where a giant, invisible boot seems to be hovering over the characters' heads, just waiting for the right moment to squash them. Until it does, they have to scrape and claw in dangerous circumstances, and the audience can only sit there wincing, powerless, while anticipating the inevitable. It helps that the lead squashee is played by Melissa Leo, a first-rate character actress who's best known for her turn as detective Kay Howard on the groundbreaking NBC show Homicide: Life On The Streets, and who also quietly out-acted the likes of Sean Penn, Naomi Watts, and Benicio Del Toro in 21 Grams. After 20 years of disappearing into roles, Leo finally gets the spotlight she's long deserved in Frozen River, but she plays it just as she would a bit part—subtly, precisely, and never reaching for more theatrics than necessary. NYTimes: If “Frozen River” is a social realist film, it has no political axes to grind. It is more interested in exploring the reluctant bond that develops between Ray and Lila than in suggesting any root causes for their situations. When that bond is severely tested, the movie refuses to sentimentalize it. Roger Ebert: "Frozen River," a debut film written and directed by Courtney Hunt, never steps wrong. It resists all temptations to turn this plot into some kind of a thriller and keeps it grounded on the struggle for economic survival. The winner of the Grand Jury Prize at Sundance 2008, "Frozen River" is one of those rare independent films that knows precisely what it intends, and what the meaning of the story is. Time: Possibly the best thing about Frozen River is that the mechanics of its busy plot do not intrude awkwardly on the portrait it offers of harsh, pinched lives. There's an easy reciprocity between Ray's struggles to evade the law and her attempts, say, to give her sons some sort of Christmas — a spindly tree, a present or two beneath it. Courtney Hunt is a spare writer and a very objective director. Her film is all show, no tell. It doesn't whine or speechify or make liberal-minded, quasi-political appeals for relief of its characters' hard lives. She lets us come to care for Ray at our own unforced pace, and Leo plays superbly in that patient vein. There's nothing overtly heroic about her as she plods forward under her burden of her small-scale dreams. She's not cynical, but she's not expecting much, either. She's just knowing and accepting of what fate, good or bad, but never transformative, throws at her. You can see it in her eyes, in her wiry body's alertness to both danger and opportunity. The reserve in Leo's performance, the way it earns our sympathy without asking for it is, is screen acting of the highest order. And her seeming artlessness is reflected, as well, in the rest of the no-name cast's work. In the end, you feel that Frozen River gives about as truthful a picture of American bleakness as it's possible for a movie to present. It is a movie that asks something of an audience, but it richly rewards our curiously rapt attention. The Guardian: Hunt is avowedly inspired by 70s cinema such as Scorsese's Alice Doesn't Live Here Anymore, and in British terms, it has a Loachian kind of social-realist grit. Leo and Upham give performances of great conviction and the film is bold and uncliched: especially the matter-of-fact treatment of guns. Simply, Hunt has got a story to tell and, though it might verge on melodrama, you really do want to find out what happens next. WaPo: By the time "Frozen River" reaches its shattering conclusion, Ray is no longer a character but a full-blooded person viewers have come to care about, even at her most heedless. And it's at this point that Hunt's filmmaking skills come most sharply into focus, as she crafts that most elusive of endings: the one that's not happy exactly, or sad, but just right. Wow, I hadn't heard what had happened to Misty Upham. That's terribly sad. She was very good in this movie. 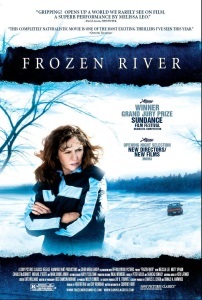 Frozen River was a damned good movie, and Misty Upham was very good in it. What a sad death. Her story--an indigenous woman sexually assaulted, abused by the police and denied adequate mental health treatment--is far too common. I hadn't heard about Misty Upham's death. What a tragic and unnecessary end. I saw this movie years ago but I remember it well. Teenage son: "There's no food." Teenage son: "Popcorn and Tang."